IBM Lotus Notes 8.5 Beta for the Mac – As Usual, It Works! 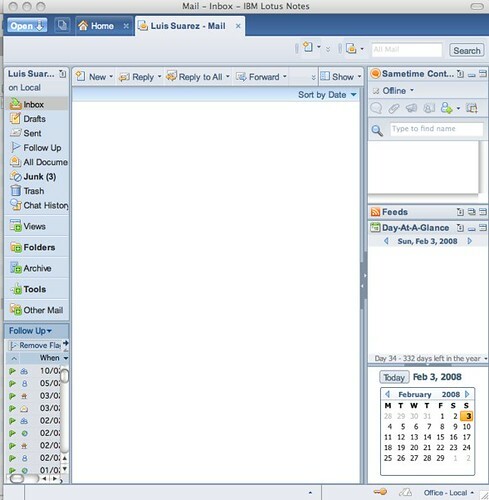 Remember when not long ago I created a blog post where I was mentioning that one of the things I was really looking forward to from the IBM Lotusphere 2008 event was getting my hands on the new Lotus Notes 8.5 Beta for the Mac? Well, things have moved on from the time where I was mentioning I was having a couple of issues with it and over the weekend I have just managed to fix them by simply doing a replace of the mail file template with the latest release of the v8 mail file template. And now… it works!! Actually, it rocks, because, as you would be able to see from the screen shot, I have reached Inbox zero on top of it and it surely looks rather nice being able to play with a very solid release, even though it is still beta, and getting rid of all of the e-mail that may have come over the weekend. Oh, and at the same time check out some of the nifty features that are coming along, like the embedded RSS / Atom feed reader client that, although simplistic, it sees to be the only one keeping up with the heavy update of Web sites like Twitter. W00t!! Yes, indeed, can you imagine? My mail box running hand in hand next to my Twitter feed? How cool is that? And that is just the beginning, because I am surely going to enjoy this beta release before we move into the next one. First, time now to explore all of the different capabilities, like installing plugins, hacking the Welcome / Home page, etc. etc. Pingback: E L S U A ~ A KM Blog by Luis Suarez » Blog Archive » Up and Running with IBM Lotus Sametime 8 for the Mac - That Works, Too!